March 1st is the day when you can register your interest to perform at Mountaingrass 2016! Please read the artist application guidelines first, there’s lots of helpful information for you to make the application process easier. Now that you’ve read the guidelines and are ready to submit your application, we’d love to hear from you! Committee News: ABOTMA is pleased to welcome Leonard Cohen as our 2016 Vice President. As a member of Old South Bluegrass band, Leonard has been a supporter of ABOTMA and Mountaingrass from the very beginning. We are very happy to have him on board. John Taylor has also agreed to join the committee as head of Governance issues. Welcome, John, and thank you for your support! Where grants applications are successful acquit the grant after it has been approved. If you are up for the challenge please drop us a line! Email info@abotma.org.au. 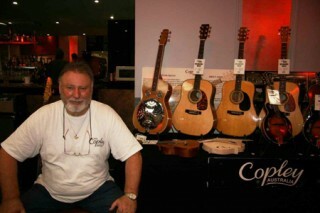 Instrument maker profile of the month: John Copley! John has been on the Canberra Bluegrass scene since the 1970’s performing on banjo & dobro with the legendary “Tag and the Noose Brothers” pioneering bluegrass music around the district for many years. During this time he constructed several banjos and a mandolin and this stirred a desire to keep making instruments. The lack of quality square neck resonator guitar in Australia led John to build one for himself. The result of this project was so successful it led to the construction of a purpose built workshop containing all the right equipment to finally allow him to pursue his long held dream of building high end custom made instruments in the bluegrass genre.